On January 10 a meeting took place with the Deputy President of the NFOŚiGW Management Board and the Director of the Department of Land Protection of the National Fund for Environmental Protection Mr. Jarosław Roliński. The meeting was also aimed at presenting a new waste management system, which we worked out together with PwC. One of the key issues was the creation of the Central Packaging Fund in the NFEPWM structures. Our system met with the approval of the director and establishing cooperation between our units regarding instruments supporting the recycling industry by the Environmental Protection Fund. We encourage you to familiarize yourself with the NFEP & WM offer and send comments to the secretariat regarding possible changes in existing instruments or proposals for new instruments, which, according to you, would have a positive impact on the development of the industry in Poland. January 7, 2019 there was a meeting with the Director of the Department of Waste Management, Emissions and Integrated Permits of the Marshal\'s Office of the Mazowieckie Voivodeship, Mr Marcin Podgórski and Director Urszula Pawlak. Representatives of the Association presented their proposal for a new system and presented the biggest problems affecting the industry, especially in the context of the amendment to the Waste Act. Representatives of the Marshal\'s Office agreed with us that the important issue would be securing claims that can be difficult to be obtained as a bank guarantee, which is why the idea of creating an auxiliary instrument by the Mazowieckie Guarantee Fund appeared. Once the solution is ready, the Association will work to make similar Instruments appear in other voivodships. November 22, 2018 in Bydgoszcz, the General Meeting of the Members of the "Polish Recycling" Association was held. The meeting was organized at the headquarters of GM Color, which presented participants their laboratory and products they have in their offer. During the meeting, the current activities of the Association were discussed, including the organization of a nationwide industry conference and the creation of a report together with the consulting company PwC "Management of municipal packaging waste in a closed circuit, System overview and proposal for a new solution". We invite you to the broadcast of the program with the speech of Mr. Szymon Dziak-Czekan in Radio Czwórka. The talk concerned the EC decision to ban the production of disposable plastic and to popularize reusable bottles in New York. We invite you from 10:40 minutes. On October 10, the "Waste management - time for radical change" conference was organized by the "Polish Recycling" Association. 200 participants took part in the event. The Association "Polish Recycling" and experts from PwC prepared a proposal for a new municipal waste management system, which was presented for the first time during the conference. It assumes the establishment of the Packaging Fund. Manufacturers introducing packaging to the market would pay for it. The purpose of the fund\\\'s existence is to finance the new packaging waste management system. On July 20, the Government accepted amendments of the Senate contained in the resolutions of 13 July on the Act amending the act on waste and some other acts and on the act amending the act on the Inspection of Environmental Protection and certain other acts. Now, the draft of two acts, urgently, were handed over to the president for signature, which has 7 days for it. Representatives of the Association actively participated in all meetings of both Sejm and Senate committees dealing with acts, where they consistently presented their amendments. Detailed information about the amendments are in the tab for Members in Polish. On 20-22 June was held V Baltic Environmental Forum. The theme of this year\'s edition was Innovative Europe towards the circular economy. During the gala ceremony, Green Certificates and awards for industry leaders were presented. The Baltic Ecological Forum is an international event with speakers from over 10 countries. Speakers included representatives of the Ministry of Transport, Construction, Maritime Economy and Inland Navigation, Provincial Inspectorate for Environmental Protection of the Provincial Fund for Environmental Protection and Water Management in Szczecin. Speakers included also Szymon Dziak-Czekan, who spoke about the future of recycling not only in Poland. June 14 in Katowice was held a Board Meeting and the General Meeting of Members. General Meetings organized in different regions is already becoming a tradition, and after Pienkow, Szczecinek came the southern regions. To Katowice we invited recyclers, who are not yet affiliated to our Association to briefly introduce them to our business and encourage them to join "Polish Recycling". After the official meetings and the informal meeting there was the possibility to watch the opening match of the Football World Cup in a friendly atmosphere. The next General Meeting is planned for November 23 in Bydgoszcz thanks to the hospitality of GM Color! On 5 June, on World Environment Day 2018, an expert discussion took place at the Ministry of the Environment on the links between economic development and environmental challenges organized by the UNEP / GRID-Warsaw Center. In the conversation about the impact of plastic pollution on business and the environment, participated, among others Director of the United Nations Environment Program for Europe, Dr. Jan Dusik. The subject of environmental pollution with plastic waste has become the object of media interest around the world in recent months. On June 4-5, 2018, the 1st Local Government Waste Management Forum was held in Gdansk, where the main effects were the implementation of the nationwide waste segregation system, preparation of local governments in practice, entrusting services to its own entities, and the challenge of achieving 50% recovery. The possibilities and barriers for communes in implementing the idea of "circular economy" was also discussed. Forum assumes the beginning of a series of annual meetings. Mr Szymon Dziak-Czekan ran the panel "Recycler\'s perspective - Is the 50% recovery rate possible in municipalities to be achieved in such a short time?" The Association "Polish Recycling" is closely watching recent reports on waste fires exploding in many places in Poland. We point out, however, that these events occur not only in landfills, but also in collection points, sorting plants or RIPOK\'s. They are burning, among others mixed waste, hard to recycle plastics, tires, waste prepared for cement works as an alternative fuel. Thus, the cause of fires can not be unambiguously determined without an individual approach to each event. For the recycling industry, this is always a waste of secondary raw materials, regardless of whether they are compressed waste prepared for sale or high-calorie storage materials. Fires in landfills are a huge problem for both citizents and waste treatment plants, finance the recovery sector and have a negative impact on the local environment. We hope that the development of the recycling industry will be a response to the growing threats posed by the waste management associated with growing consumption. We are in hall D, courtesy of Mr. Jerzy Kamiński from Repro Plast. April 27 during the 4th European Congress of Local Governments in Krakow was held a debate, prepared by the "Rzeczpospolita" "Energy independence of Poland through responsible and effective waste management". Among the panelists was Mr. Szymon Dziak-Czekan and Deputy Minister of the Environment Sławomir Mazurek. During the debate, it was considered whether waste management would allow Poland\'s energy independence, how to reduce energy consumption with the correct use of waste - not only through energy recovery, but also by creating a market for secondary raw materials. The debate also revolved around the role of local governments in the entire waste management system, also in the thermal treatment of waste. April 24 in Liberec has started 11th International Conference on Mechanical and Biological Waste Treatment. Mr. Szymon Dziak-Czekan was invited there to give a lecture about the chance for the Polish economy related to the blockade of the Chinese market. The theme of the conference was the location of the MBP installation in the context of the circular economy. They were also discussed about their transformation into the so-called recycling centers and on the management of bio-waste or quality and requirements for secondary raw materials. During the meeting, reference was made to the comments provided after the first workshop and many optimal solutions were proposed. The PwC representative also presented many interesting solutions that have been applied in other countries that have a real impact on the quality of collected household waste, or encourage producers to use recyclable materials. Work on the report and the model are still ongoing. 28.02 - 01.03 Kielce Trade Fair of Environmental Protection and Waste Management EkoTech took place in Kielce. Great emphasis was placed on the exhibition of equipment and machines for waste collection, waste reduction and segregation, as well as the cleanliness of public space. Amongst the stands were litter bins, machines for cleaning them and quick emptying, street cleaning cars or biodegradable waste bags. During the fair there were many accompanying events. On February 28, at the waste management forum, the leitmotif was bio-waste and ways of dealing with them through RIPOK. On March 1, the conference "Challenges for local governments - recycling and financing of the waste management system" was held. "The issues of economic efficiency of waste management systems and building an effective waste management system were discussed. On March 8, 2018, the Faculty of Chemistry of the Warsaw University of Technology organized the "Meeting with Industry 2018" under the honorary patronage of the Vice-President of the Council of Ministers, Minister of Science and Higher Education, Dr. Jaroslaw Gowin and the Rector of the Warsaw University of Technology. dr hab. Eng. Jan Szmidt. The Polish Recycling Association was represented by Mr. Sławomir Pacek and Robert Kucicki. This event was a good opportunity to give the gathered guests their particular achievements, asking for financial help and support from participating companies. An important dialogue was established because the "other side" - the industry also in its speeches provided information about its production profiles and pointed out where they can be helpful. There was also time to present didactic cooperation with the industry. There were discussed internships, apprenticeships and post-graduate studies educating people with a typical work profile adapted to the industry. On 1 February in Warsaw at the Nowotel hotel was held the 7th International Waste Management Forum SOS EXPO. The forum was divided into thematic blocks such as innovation and financing in EU projects, implementation of new rules in separate waste collection and requirements of recyclers of various packaging. In the case of innovative projects, great attention has been paid to local development plans as stimulation of GOZ, eg creation of renewable energy sources. Much space was devoted to municipalities, whose representatives talked about good practices of implementing innovations in their areas. The last thematic block was to draw the attention of the gathered, how important it is to maintain standards of secondary raw materials for the quality of the recycling process. Three representatives representing three types of recyclable materials (paper, glass and plastics) presented their segments taking into account and emphasis on occurring pollution, difficulties, but also high standards of supply of processed raw material. 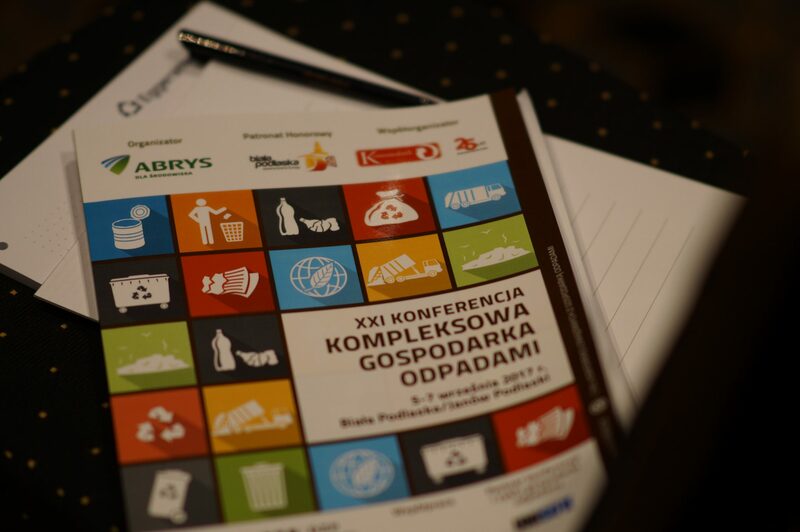 January 24, 2018 In Łódź, a conference organized by the Abrys publishing house "Selective collection, segregation and recycling of waste" took place. The main issues of the event were the determination of what awaits us in the coming years in the waste management, are we in constant legal changes and are we able to meet the EU obligations? During the conference also topics related to the circular economy were discussed, what are visions of development in Poland and in Europe. The three-day conference ended with a study trip to Ruszczyn in the Kamieńsk commune (Łódzkie Voivodeship), where the installation of mechanical and biological treatment of municipal waste along with the alternative fuel production line (RDF) is located. Mr. Szymon Dziak-Czekan\'s statement was published in the largest industry magazine Recycling Today. The Embassy of the Kingdom of the Netherlands in Warsaw and the Institute of Innovative Economy invited Assosiation to an expert meeting titled “Circular economy in practice”. the 24th of November on the occasion of the visit of a Dutch delegation of experts from different backgrounds, all working in the field of circular economy. The Aim of workshop was to exchange ideas and experiences in specific fields of how circular economy can be implemented in practice and to strengthen the Polish – Dutch cooperation in this field. A particular focus was placed on how partnerships, for instance between organisations from the public and private sectors can contribute to this aim and how such partnerships could be started in Poland. Examples to be used are the Dutch ‘green deal’ approach and circular procurement in the Netherlands. On November 23, the conference "Circular Economy - business and consumer on the path of change" was held in Warsaw. The conference presents international experiences in this area and discusses possibilities of implementing similar activities in Poland. The special guest of the event was Peter Lacy - Managing Director of Growth, Strategy and Sustainability at Accenture. The conference also featured closed-circuit business models, as well as a discussion on sustainable consumption and consumer awareness. The event was held under the honorary patronage of the Embassy of the Netherlands, the Ministry of Development and the President of the Republic of Poland. Warsaw. On November 14, the meeting "The future of extended producer responsibility in Poland" was held in the Polish Chamber of Commerce - a debate of the main stakeholders of the system of recovery and recycling of packaging regarding the necessary changes in the system. The meeting was an expert nature with the participation of the main stakeholders of the collection system, sorting and preparation for recycling / recovery of packaging waste, including representatives of territorial self-governments, entities dealing in waste collection and sorting, recycling / recovery installations, introductory entrepreneurs and selected recovery organizations. November 08, 2017 International ECO-CITY INNOVATIVE conference: healthy environment, healthy people! Participants discussed the impact of climate change and environmental pollution on human health. They also exchanged experiences on different strategies for engaging residents in adjusting to change. As noted, the creation of opportunities for citizens such as open data, smart applications and devices, as well as favorable laws and administrative support, only leads to changes when people are involved in their implementation. On 8-9 November, a conference "Paper & Plastic Recycling conference Europe" took place in Warsaw. This is the event that brings together the largest number of participants, particularly with paper recycling. Mr. Szymon Dziak led the panel on changes in packaging regulations under European Union law. On November 6, 2017 in Warsaw took place the first meeting of PET industry recyclers with representatives of the "Polish Recycling" Association took place. During this event, were present the most important representatives of this industry including IMP Polowat, PRT Radomsko, Elcen, Pol-Servis, Ergis and Eurokey Polska. During the meeting were discussed the issues of the Polish waste management system - a common position was developed to introduce a deposit system for PET bottles, which is being talked about more and more frequently. The meeting was conducted in a nice atmosphere and it turned out to be a great success. It has resulted in setting paths for joint activities aimed at improving the situation of the entire plastics recycling industry. On 23rd of October, 2017 a workshop entitled "SWOT Analysis of the Implementation of the Deposit System for Packaging in Poland" organized by Deloitte Advisory Sp. with o.o. Deloitte Advisory Sp. with o.o. on behalf of the General Directorate for Environmental Protection, works on the public procurement "Preparation of a study on the possibility of introducing a packing system for packaging in Poland". The workshop was attended by representatives of the Ministry of the Environment, GDOS and industry associations. The meeting was attended by a representative of the "Polish Recycling" Association, whose agenda for the general meeting was 15.11.2017. includes the development of a recycling industry position on the introduction of the depository system in Poland. On October 16, President of the Management Board Szymon Dziak-Czekan was a guest of the program #RZECZoBIZNESIE. On October 12 there was a debate "Rzeczpospolita": Circulal Economy moderated by Michał Niewiadomski. This was the first debate of "Rzeczpospolita", during which experts talked about "circular economy". The discussion was about questions: What should be done to make our economy start moving towards a closed loop? What are the challenges for Poland, in terms of administration, business and society? The role of experts appeared: Łukasz Sosnowski from the Ministry of Development, Agata Staniewska from CEC Government Relations, Przemysław Hopfer from KGHM Metraco, Irena Pichola from Delloite, Agnieszka Sznyk from the Institute of Innovative Economy and Szymon Dziak-Czekan from the Polish Recykling Association. On September 29, 2017 at the headquarters of the National Fund for Environmental Protection and Water Management held a business meeting about the importance of extended responsibility of the producer for the development of recycling in Poland, in which participated as a representative of the Association Mr. Szymon Dziak-Czekan. The moderator of the meeting was Ms. Katarzyna Blachowicz from the quarterly Recykling. 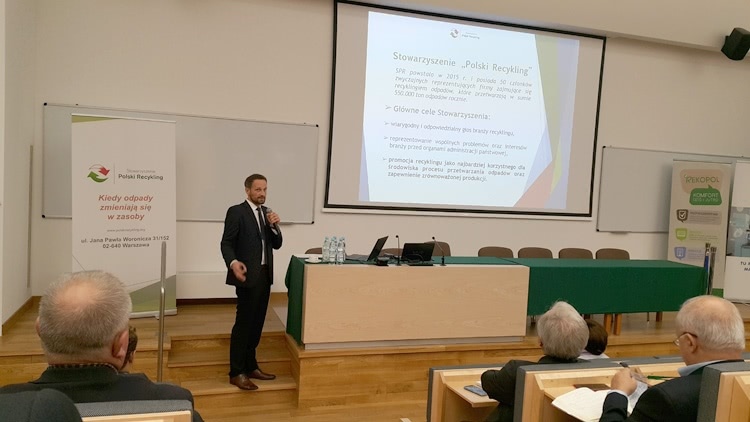 After the great success of the conference "Opportunities and Threats to Polish Recycling", the Association in cooperation with the Warsaw University of Technology organized another event: "Recycling. Packaging. Innovations." 5 września w Janowie Podlaskim rozpoczęłą się organizowana przez wydawnictwo Abrys konferencja „Kompleksowa gospodarka odpadami”, podczas której starano się odpowiedzieć na takie pytania jak : Czy inwestycje w gospodarce odpadami komunalnymi służą gospodarce o obiegu zamkniętym? Ile wysiłku należy włożyć, by powstał wartościowy kompost? Jak wielkim problemem dla instalacji są trafiające z komunalnymi odpadami popioły z palenisk przydomowych? Wśród znakomitego grona prelegentów był również przedstawiciel Stowarzyszenia- Pan Szymon Dziak-Czekan, który prowadził prelekcję na temat standardów selektywnej zbiórki surowców wtórnch. W dniach 7-9 września odbyła się 13. Środkowo-Europejska Konferencja RECYKLING I ODZYSK INNOWACYJNE TECHNOLOGIE MATERIAŁÓW POLIMEROWYCH NAUKA – PRZEMYSŁ 2017. Konferencja obejmowała takie zagadnienia jak: technologie utylizacji, maszyny i urządzenia, kształtowanie właściwości i nowe aplikacje, technologia przetwórstwa tworzyw i kompozytów polimerowych, biomasa, biomateriały, biokompozyty oraz odzysk i oszczędność energii. Podczas wydarzenia wystąpienie miał Pan Szymon Dziak-Czekan, który mówił o systemie gospodarki odpadami opakowaniowymi w Polsce wobec nowych wyzwań polityki UE.